It’s the time of year when hundreds of football clubs around the UK are considering upgrading their seating. For some clubs, the tantalising prospect of promotion suddenly brings with it some practical considerations – not least the FA’s ground grading requirements which can mean that in a few months’ time fifty or one hundred more seats may be needed. For others, it’s simply a case of upgrading or expanding their seating capacity. Audience Systems’ solution is the most simple on the market. The Premier Grandstand is a complete, instant covered seating grandstand. 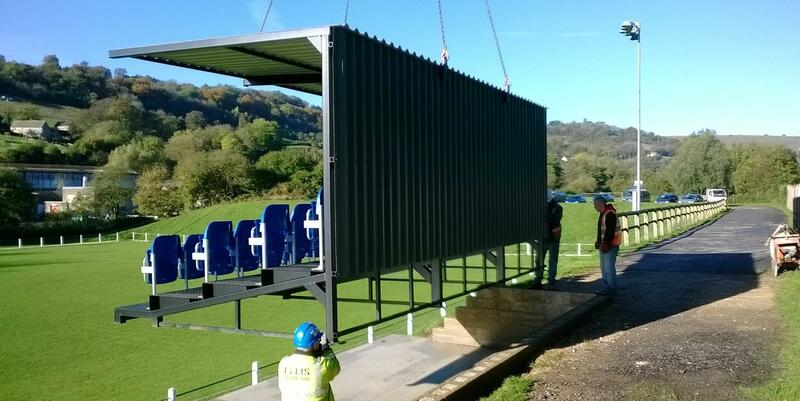 The football club just needs to provide a suitable concrete base and we arrive on site with the stand fully assembled, crane it into place and fix it down. Problem solved. The seats are FIFA/UEFA approved and the stand comes in a range of sizes with a menu of finishes, options and accessories – see our Premier Grandstand page for more details. Of course it’s not just football clubs looking to meet ground grading requirements who can benefit from this instant solution. Schools, rugby clubs, race tracks… in fact any outdoor spectator venue you can think of can all add seating capacity instantly, simply and economically. See our Premier Grandstand page for more details, or contact our Premier Grandstand sales team here.